One of the more uniquely themed restaurants in Walt Disney World is 50s Prime Time Cafe in Hollywood Studios. My tour guests ate there today, and were entertained by their server. He insisted that the kids eat their vegetables, and he treated them like members of his family. This is certainly more of a dining experience than just a meal! 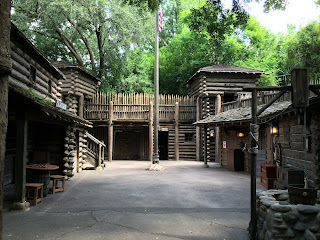 One of my favorite places to find a relaxing spot in the Magic Kingdom is Tom Sawyer Island. I was there a few days ago and it was pretty empty, as you can see from this picture of Fort Langhorn. It was around 11:00 and most of the Magic Kingdom was packed, but there were several areas on the island where you could find a quiet place to sit. Today, we went to Typhoon Lagoon for the first time in years, and it was our son's first visit. He wasted no time in heading over to the park's most thrilling attraction, Humunga Kowabunga. This steep water slide drops guests at a 60 degree angle at a speed of 30 miles per hour. I did not like the "landing" as it is less than comfortable on upper backs. However, our brave 7 year old rode it repeatedly. I took this photo of my favorite attraction a few days ago. 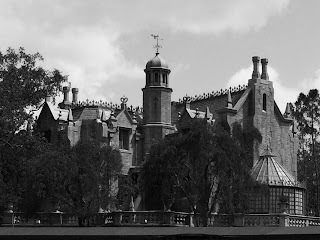 Since it is an 18th century mansion, I decided to give it an appropriate old, gothic look with a black and white filter. I was across the river on Tom Sawyer Island when I took this shot. 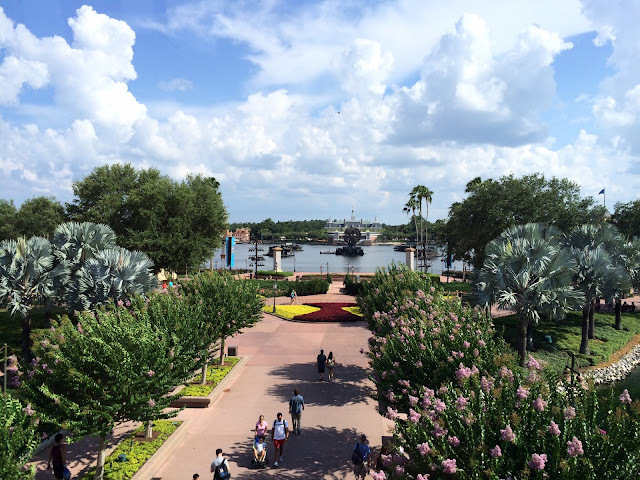 Some of the best views of Liberty Square and Frontierland can be found there. Yesterday, I took a walk on the path that extends out from the Magic Kingdom entrance toward the Grand Floridian. This is the first time I have ventured into this area, and I found it very scenic and serene. It is part of the "Walk Around the World" bricks that have the names of guests on them. 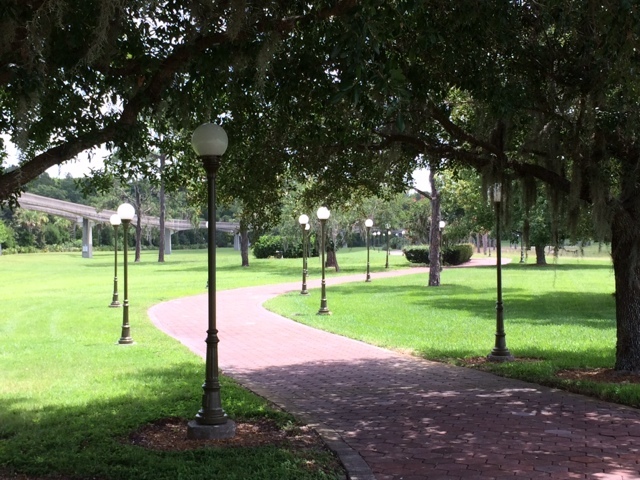 It is rare to see anyone walking on the path because there isn't a distinct entrance. You basically walk through the Polynesian/Floridian boat launch area and keep going. The views were amazing from the walkway and it was surprisingly quiet. 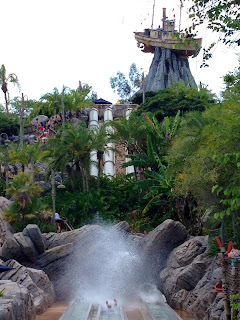 It was hard to believe that the busiest theme park in the world was only about 100 yards away! 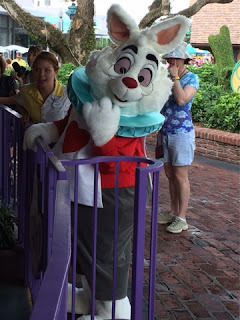 Today, while in Fantasyland, I noticed the White Rabbit standing by the Mad Tea Party. Normally, there is nothing unusual about seeing this guy near this ride, as he typically greets guests in this area. However, he was waiting here to do something special today. Shortly after I took this photo, he rode the attraction with a lucky guest. 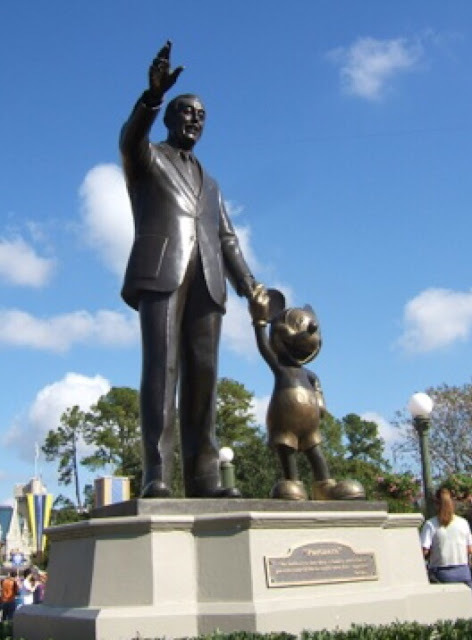 On this date in 1893, Roy O. Disney was born in Chicago, Illinois. Although Walt was the creative force behind the Disney company, Roy was an important part of its success. Without Roy's business sense and leadership after Walt's death, it is quite possible that Walt Disney World would have never been built. The "Sharing the Magic" statue in this picture is located on the spot where Roy dedicated the Magic Kingdom back in 1971. It is a fitting tribute to the man who made sure his brother's dream became a reality. 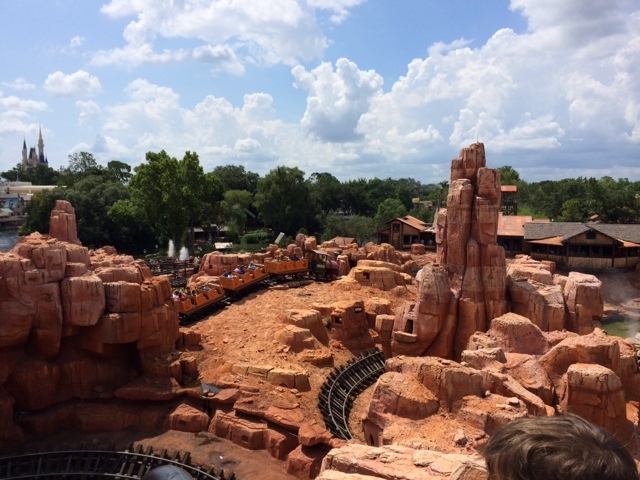 I took this shot on top of the second lift hill on Big Thunder Mountain Railroad a few days ago. I was able to get Cinderella Castle and the load/unload building in the same frame. Also, the timing was perfect, as another mine train went by right in the middle of the photo. I always enjoy getting "on-ride" photos whenever possible. This a fun shot that I like to attempt whenever I get the chance. Prior to the Epcot monorail entering the station, it loops through Future World giving you great views of the park. I snapped this photo just as we passed over the main walkway to World Showcase last night. You can see The American Adventure in the distance, as well as the Illuminations Earth Globe. The Volcano Pool at the Polynesian Resort is shutting down at the end of July for a major refurbishment, and not opening again until March. We decided to spend some time there today, and of course I had to take some pictures of the area. There are so many changes coming to the Polynesian, and it will be interesting to see what this pool looks like when it reopens next year. Today marks our one year anniversary of moving to Florida, and also the first day of summer. I thought it would be fun to post a picture of a summertime activity! As I walked through Tomorrowland today, I quickly noticed something was drastically different about the Rocket Tower Plaza area. I knew they were doing a major refurbishment of the PeopleMover and Astro Orbiter. However, I was surprised to see the centerpiece of this land almost entirely gone! In all the years I've been coming th the Magic Kingdom, I have never seen the rockets completely removed. It will be interesting to see if the attraction will look different when it re-opens in September. 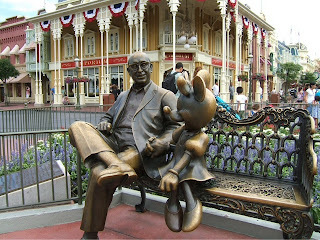 Today is the 19th birthday of the Partners Statue in the Magic Kingdom. This amazing statue was created by Blaine Gibson, who also sculpted all of the presidents in The Hall of Presidents, other than Obama. This bronze version of Walt and Mickey is identical to the one installed in Disneyland in November of 1993. If guests would like a photo with Lightning or Mater, they need to look no further than Hollywood Studios. They are the only two characters from the Cars movies that can typically be seen at Walt Disney World. 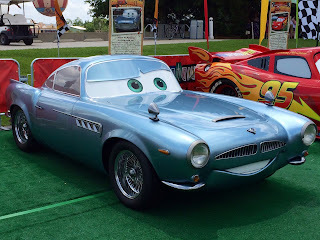 However, this past weekend, Finn McMissile was spotted at Downtown Disney as part of Car Masters Weekend. When most people think of Walt Disney World they think of exciting attractions, fun shows, and massive crowds. This is certainly an accurate description, but it is only part of the story. 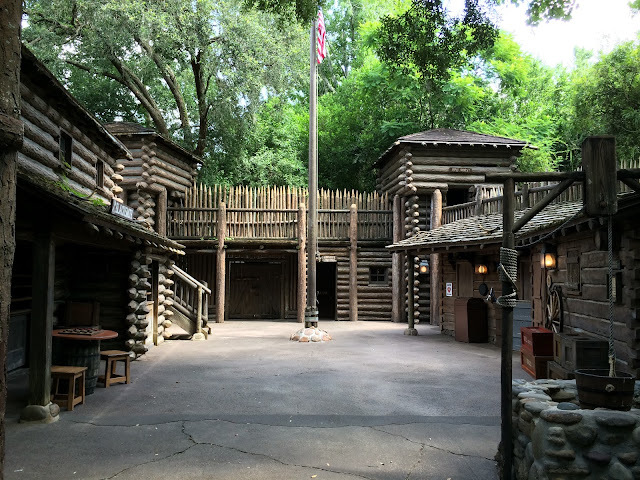 There are many great spots to "get away from it all," and Fort Wilderness is one of my favorites. This area is near the horse stables and has the feel of being on a ranch far from civilization. It is hard to believe that only a few miles away there are typically more than a quarter of a million people enjoying four of the busiest theme parks in the world! 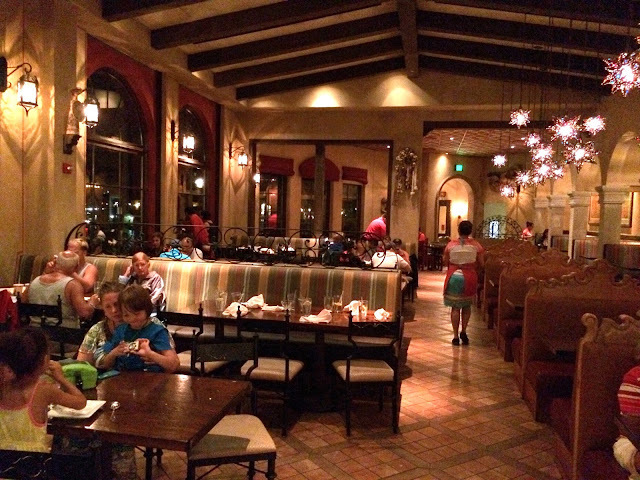 Last night, my wife and son took me to La Hacienda de San Angel for Father's Day dinner. This was our first time eating at this waterside restaurant at the Mexico pavilion in Epcot. This spot has great views of World Showcase Lagoon and the food was very good. Although we didn't eat there specifically to see Illuminations, we were having dessert when the show was scheduled to take place. However, for only the third time in fourteen years, it was cancelled due to hazardous weather that prevented cast members from completing the "set up." Today, we attended our first Car Masters Weekend at Downtown Disney. 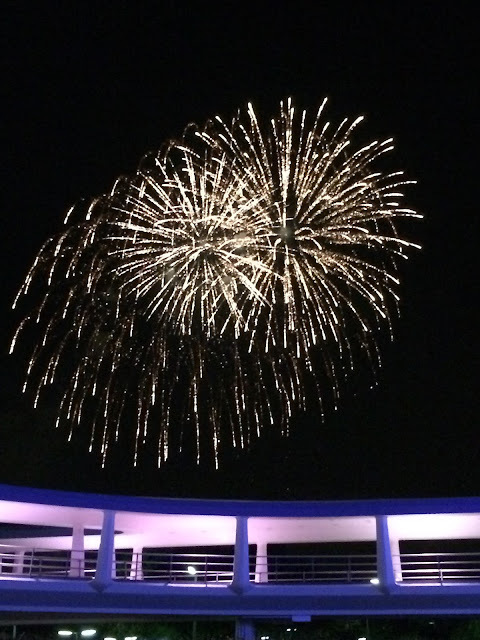 This annual event features over 100 classic and unique cars on display for guests to admire. There were also some very famous Cars movie characters present, including Lightning McQueen, Mater, and Finn McMissile. This was a fun Fathers Day activity and we plan to enjoy the show for years to come. 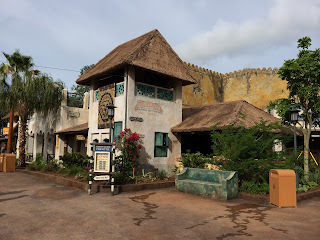 A few weeks ago, The Festival of the Lion King reopened on its new location in the Africa section of Animal Kingdom. I posted a picture of the exterior that day, showing how different the area looked from its previous location. Today, I am posting a shot from the actual show, which really hasn't changed at all. Most guests loved the old show, so it was smart for Disney to keep it the same. 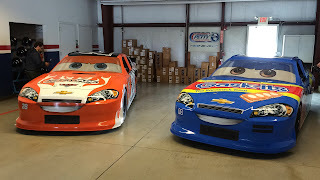 As part of a special media event today, my son and I saw the unveiling of two "character" cars at the Walt Disney World Speedway. Aiken Axler and Sage VanDerSpin are now part of the Junior Ride-Along Experience at the track. Children ages 6 to 13 can actually go for a ride in one of these cars from the Pixar movie. My son was lucky enough to be one of the first kids to try out this new experience and he loved it. I wrote a full article for LaughingPlace.com, which should be available on that site very soon. Today we say happy 20th birthday to Sunset Boulevard at Hollywood Studios. 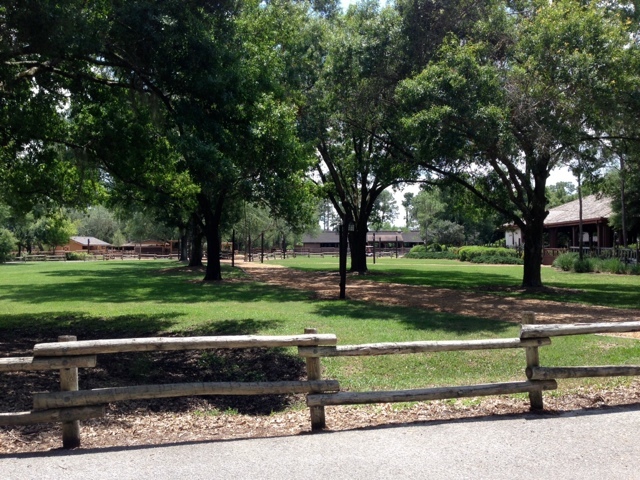 This area of the park opened on June 12th, 1994. On this date, the newly relocated Beauty and the Beast show debuted in the 1,500 seat Theater of the Stars. Tower of Terror opened later that summer and Fantasmic came along four years later, in 1998. 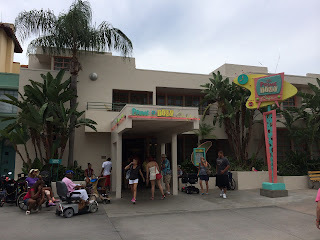 Finally, Rock 'n' Roller Coaster opened in July of 1999. With these four major attractions, Sunset Boulevard is certainly the busiest area of the park. 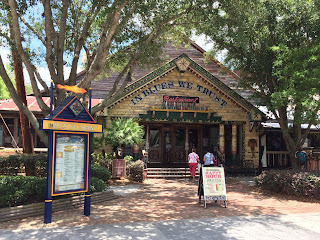 Last week, I had the chance to enjoy lunch at House of Blues with my wife. This is one of the few Downtown Disney spots that I hadn't yet tried. The food was very good and the theming was fun. I highly recommend the Bourbon Bread Pudding for dessert, which can be shared between two people! 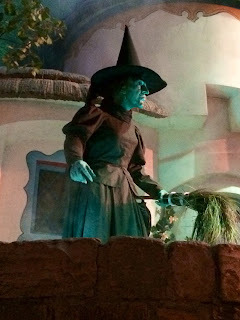 Earlier this week I posted a picture of the wicked witch from The Wizard of Oz. 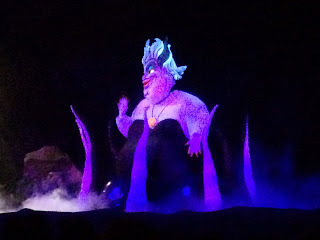 I'm going back to that theme with Ursula, the sea witch from the Voyage of the Little Memaid at Hollywood Studios. I watched this show with my son over the weekend, and enjoyed it as usual. The Ursula figure is quite large and certainly impressive. Today we say happy 80th birthday to the one and only Donald Duck. 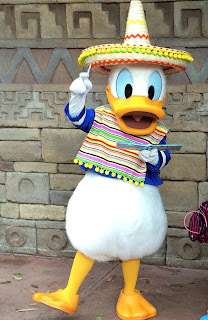 He can be found in many places throughout Walt Disney World, but one of my favorite versions is "Mexican" Donald at Epcot. Here is a shot of the famous duck signing an autograph for one of my young tour guests. This meet-and-greet takes place right outside of the Mexico pavilion. 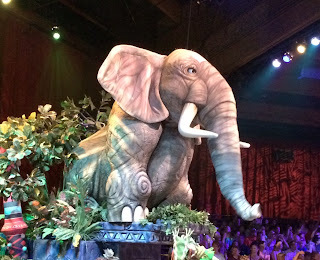 One of the most advanced audio animatronics figures in all of Walt Disney World is located in The Great Movie Ride. Yesterday, our ride vehicle stopped right in front of the Wicked Witch from the Wizard of Oz scene. She is incredibly lifelike and many guests have a hard time believing that she isn't a live cast member. 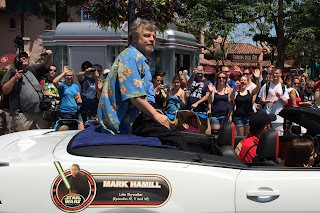 Today was a memorable one at Star Wars Weekends as Mark Hamill was there. I was able to get a good spot to see the "motorcade" come down Hollywood Boulevard, and it was fun seeing Luke Skywalker himself go passing by. There were several Star Wars stars at Hollywood Studios today, but Mark was certainly the big draw! The Magic Kingdom ferry boats are an essential part of the Walt Disney World transportation system. 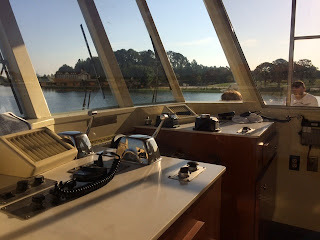 They transport thousands of guests across Seven Seas Lagoon each day. While docked at the Transportation and Ticket Center last week, I was able to get this shot of the pilot house on the General Joe Potter. You can see the two tillers and two throttles which control the very large diesel engines that power these 600 passenger vessels. Here is a shot of one of my favorite hidden Mickeys in all of Disney World. 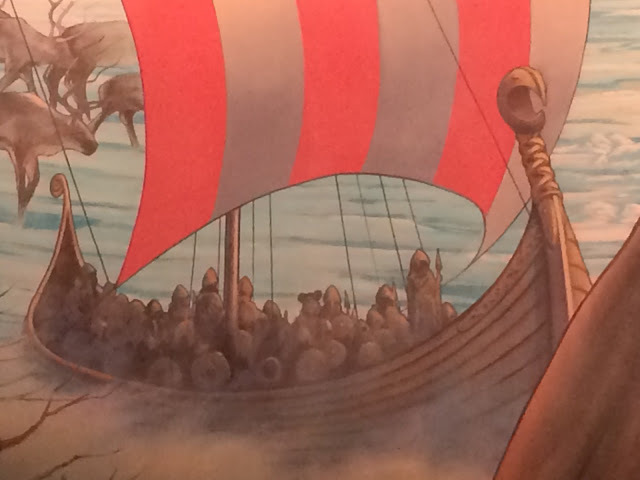 This is a close up on a Viking ship that is part of the giant mural in the load area for the Maelstrom attraction in Norway. If you look closely, you can see that one of the Vikings is wearing Mickey ears. 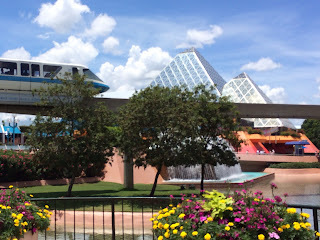 I took this picture last week, while giving a tour of Epcot. 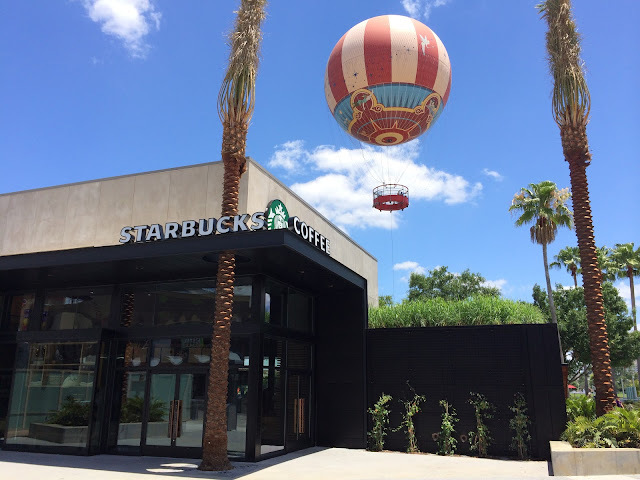 Just a few days ago, a brand new Starbucks opened at Downtown Disney. It is a large location with indoor and outdoor seating. Not far from this spot is the Characters in Flight balloon dock. You can see the balloon in this picture I snapped today. A few days ago, I finally took part in the Animation Academy at Hollywood Studios for the first time. My son has become very interested in drawing, and this is a great place for aspiring artists. 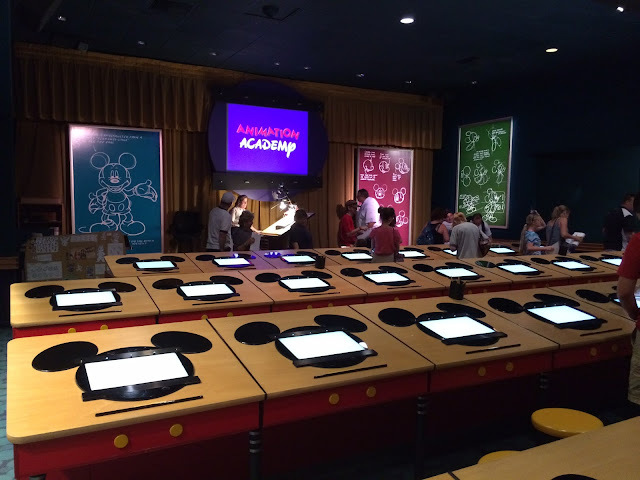 For those who haven't been, a talented cast member instructs a class of about 50 guests on how to draw a character from a Disney animated film. In this class, we learned the step by step process for creating the face of Genie from Aladdin. I took this shot a few days ago while giving a tour of Epcot. 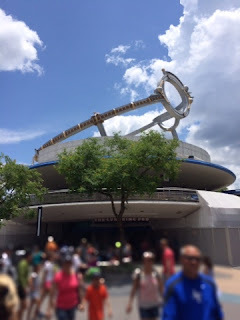 I always find it fun to incorporate the monorail into photos of Future World. I chose today to post Journey into Imagination because on this date in 2002 the attraction was re-dedicated to once again include Figment, the little purple dragon. He had been removed from the ride in 1999, but brought back due to the overwhelming reaction by Epcot fans who were disappointed by his disappearance. The Festival of the Lion King debuted this morning in its new home in the Africa section of Animal Kingdom. For more than four months the area behind Tusker House was under construction. When the walls came down today, an amazing new theater was revealed. The exterior of the building fits in perfectly with the African theming of Harambe Village. However, the inside is nearly identical to the original theater. Also, Lion King fans will be happy to hear that the show is virtually the same one that has been entertaining guests for more than 15 years. After walking out of Space Mountain last night, we caught a unique view of the finale of Wishes. The speakers in this area were louder than some on Main Street. 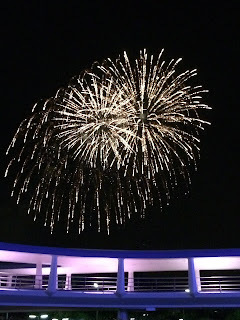 Although we couldn't see the castle, the view of the fireworks was great from here. Also, this spot wasn't crowded at all!